Just over a year ago, Minnesota lost one of its most famous citizens. Prince Rogers Nelson (known as Prince for the majority of his career) died in his Chanhassen home last April. In the time since his passing, remembrances have popped up in different ways. On the anniversary of his death, Minnesota landmarks glowed purple (and beyond Minnesota as well). His ex-wife, Mayte Garcia, has published a memoir. And box sets, like this one which Sunrise created for him, take on the role of keepsake boxes. This custom promotional box housed box set “One Nite Alone…Live!.” The box contains a thermoformed tray, designed to fit three discs of live music spanning decades. Not only is it a great example of presentation packaging, but the attention to detail is evident. From the piano key-influenced box sides to the thumb holes, aiding the user in opening the package. Ever cognizant of his users, this allows fans to open the box without potentially harming the discs. Keepsake boxes might have a reputation for being the domain of the sentimental. But in reality, it’s simply about holding on to memories that have a tangible representation. Like holding on to concert tickets that remind music lovers of the experience of seeing their favorite acts live. Or an autographed piece of memorabilia. Anything with significance to the owner of the box gives it value and staying power. Keepsake boxes, or grief memory boxes, can actually help the grieving process. They can act as a central space for people to remember someone who was important to them. In a sense, they can actually contain the grief of a person. This aids in emotional regulation and processing. It helps people face pain and grief instead of avoiding it. When it comes to the passing of mega-stars, like Prince, keepsake boxes can act as connections between people. They increase communication by encouraging contributions, sharing memories, and engaging in a collective, cultural experience. One of the world’s most prolific songwriters, Prince was known for the level of customization he brought to his craft. Prince’s sense of style and presentation extended past his flamboyant stage presence. He carefully controlled his image and merchandise. Additionally, he was proud of his Minnesota roots, and sought out local businesses to patronize. 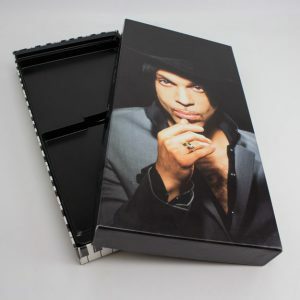 These albums are ideal keepsake boxes for fans who will forever miss this artist.